The information below will explain our VP Framing, Roofing and Wall Systems. If you don't find the answers you are looking for here, feel free to call our office and we'll provide you with more detailed information. There are eight basic VP quality framing systems. Each construction format is designed to accommodate your specific building requirements. All frames can be specified for use with non-load-bearing conventional walls -- glass, tilt-up, block, etc. Continuous Beam and Continuous Truss are recommended with load-bearing block or tilt-up. Ideal for unobstructed, economical spaces and provides unsurpassed interior flexibility. Clear spans up to 300 feet or more are available. Utilizes interior support columns to provide larger interior spaces for the lowest cost per square foot of any of our framing systems. Offers total flexibility in locating interior columns. Interior column spaces can reach 100 feet or more. Offers the features of Rigid Frame with the advantages of open web for optimal placement of wiring, ductwork, lighting, etc. All the advantages of Continuous Beam with the added benefit of open-web framing which can accommodate wiring, ductwork, and pipes -- reducing building heights. Ideal for smaller clear-span building conditions up to 70 feet when a straight side wall and flat interior ceiling are desired. VP's Transbay Bar-Joist System can be used with all VP framing systems. The system allows any bay spacing you need and is particularly appropriate for bay spacing in excess of 40 feet. Deck-Frame is the first metal building support solution specifically designed for membrane roof applications. Deck-Frame combines the efficiency, speed and economy of metal building construction with the aesthetic performance of a membrane roof system. VP roof systems, consisting of panels, insulation and secondary framing, are unsurpassed for weather tightness and provide a high-quality structure that lasts. Roof Slopes as low as 3" in 12"
Wall systems consist of coverings, insulation and secondary framing. VP buildings are highly compatible with any conventional wall materials. 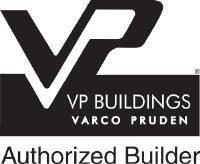 In fact, virtually any wall materials can be used with the VP building system. Lengths from 2'-0" to 25'-0"
*Note: Colors online may not represent the exact color of the panel.